The Ford Sierra may have all but disappeared from Britain’s roads but on the ovals they live on in the rear-wheel-drive Lightning Rods. This formula offers old-school side by side non-contact racing, with high speeds and spectacular tail-slides guaranteed from these experienced drivers. Many drivers come into the formula after competing in contact classes so they have the skill and competitive nature to put on an excellent show every time. 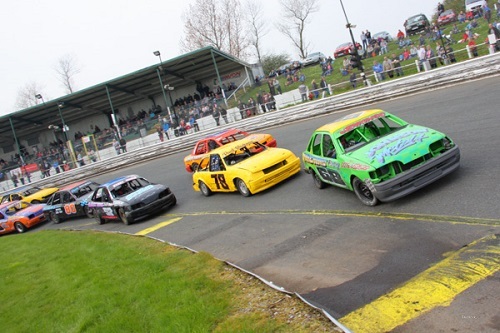 Drivers from across the UK and Ireland travel to Spedeworth/Incarace’s raceways on a regular basis to take on the stars of the ovals, and tight NASCAR-style battles have become a common feature of Lightning Rod meetings. The highlights of the Spedeworth/Incarace calendar are the annual National Championship Weekend staged over three days at Hednesford Hills Raceway and the two day Spedeweekend spectacular held at Foxhall Heath Stadium, Ipswich which will be the stage for the 2015 World Championship. The Lightning Rods can be seen at all Spedeworth and Incarace operated tracks over the year.